We Can Help You Build Your Team! Dragons Alive offers custom designed corporate events as social activities or team building events. 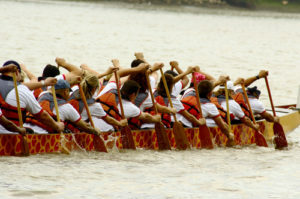 Learning to paddle together is working toward a common goal, and is at the heart of dragon boating. Qualified coaches work with your team to build an experience that can translate into effective working relationships. Events can be customized to your time and goal requirements; every session can include a warm-up exercise, instruction in paddling technique, time on the water learning to paddle the boat and practicing, timed heats, lessons learned from paddling together, and light refreshment depending on your needs. Please call or email Louisa Matthew at matthewl@union.edu or 518-429-4908 for more information.